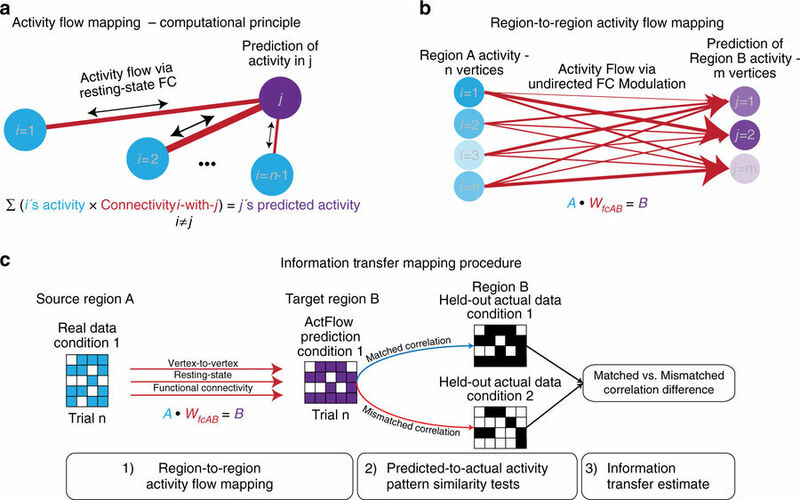 Measuring information transfer through activity flow mapping and cognitive task information decoding. a Computational principle of activity flow mapping, as used by Cole et al.14. Adapted with permission from Cole et al. Activity in a held-out region is predicted by computing the linear weighted sum of all other regions’ activity weighted by those regions’ resting-state FC estimates with the held-out region (the held-out region’s activity is not included when computing the predicted activity of that region, thus avoiding a circular prediction). b Region-to-region activity flow mapping between vertices/voxels of isolated regions (“many-to-many” rather than “all-to-one” mapping of regions). Mathematically, we predict the activation pattern in Region B by computing the dot product of Region A’s activation pattern vector with the vertex-to-vertex resting-state FC matrix between Region A and B. c Information transfer mapping, which involves region-to-region activity flow mapping and representational similarity analysis (information decoding/classification) on held-out data. To test the transfer of task information from Region A to Region B, we compare the predicted activation pattern of Region B (mapped using Region A’s activation pattern) to the actual task activation pattern of Region B for all task conditions using a spatial Spearman’s rank correlation. For every prediction, spatial correlations to the task prototypes are computed and the information transfer estimate is measured by taking the difference of the correctly matched spatial correlation to the average of the incorrectly matched (mismatched) spatial correlations. Here, we depict the approach for only two task conditions. The human brain is thought to be a distributed information-processing device, its routes of information transfer constituting a core feature that determines its computational architecture. Many studies have used correlations among resting-state functional MRI (fMRI) time series to study functional connectivity (FC) in the human brain1 (see ref. 1. for review). It remains unclear, however, if these resting-state FC routes are related to the brain’s routes of cognitive information transfer. Evidence that group and individual differences in resting-state FC correlate with cognitive differences2,3,4 suggests that there is a systematic relationship between resting-state FC and cognitive information processing. However, without linking FC to information transfer, it remains unclear whether or how resting-state FC might mechanistically contribute to neurocognitive computations. Additionally, while a number of studies have shown that task information representations are distributed throughout the brain5,6,7,8, such studies have yet to reveal how these distributed representations are coordinated, and how information in any one brain region is used by other brain regions to produce cognitive computations9. Other studies investigating interdependence of brain regions during tasks (rather than during rest) have typically emphasized statistical dependencies between regional time series10,11,12, rather than the mechanistic transfer of task-relevant information content (reflected in task activation patterns13) between those regions. Thus, it remains unclear whether or how the network topology described by either resting-state or task-evoked FC is relevant to the neurocognitive computations underlying task performance. Here, we provide evidence for a network mechanism underlying the transfer and coordination of distributed cognitive information during performance of a variety of complex multi-rule tasks.